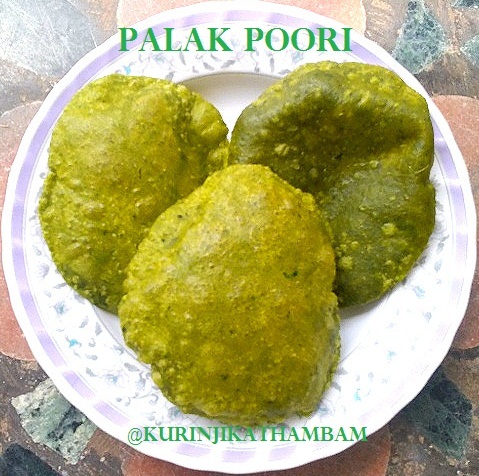 The value of color poori is giving attractive green color to the normal pooris and also mixing the goodness of palak with the tastiness of poori. For kids this makes them eat more and also intake the healthy palak. 1. Heat one cup of water in a wide bowl. Bring it to boil and add the green chilli. 2. Then switch off the flame and put the washed palak leaves into the hot water. Remove the stem if the stems are very strong, otherwise use with stem. 3. Leave it for 2 mins and remove from the water and strain it completely. 4. Grind them into a fine paste using mixer grinder with little water . 5. 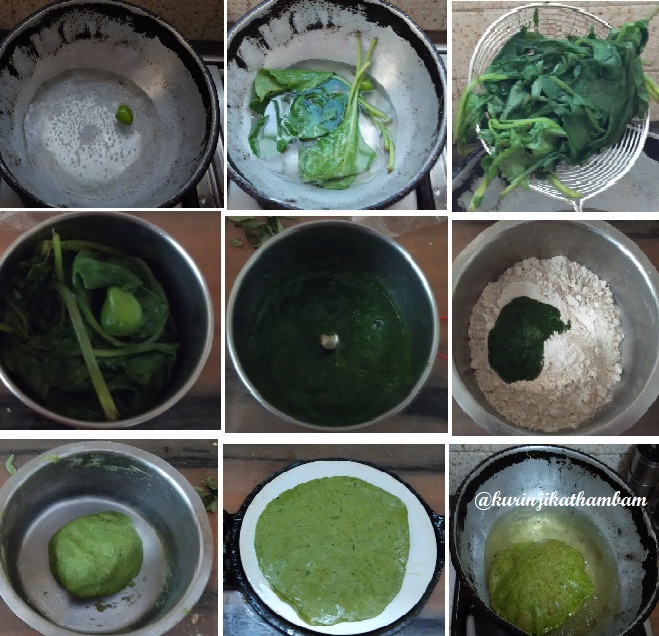 Add the wheat flour, palak paste and salt in a bowl. Mix them well, then add water little by little and knead it into a soft dough. 6. 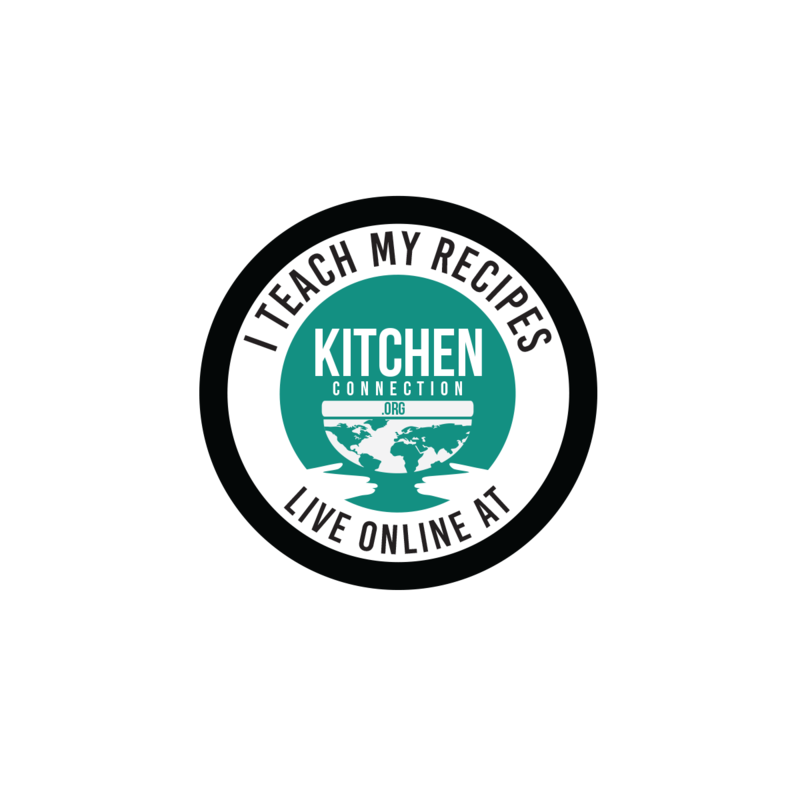 Divide the dough into a small lemon size balls and rollout into small pooris. 7. Heat the oil in a pan and slide the poori into it. After few seconds press it with the help of the ladle with the holes. When it puffs up, turn over it carefully and fry the poori till the poori becomes crisp. Then take it out from the oil and drain the oil using tissue paper. Healthy and colorful palak poori is ready. Serve it with poori masala or vegetable kuruma or raitha. 1. You can also filter the palak paste before using it.